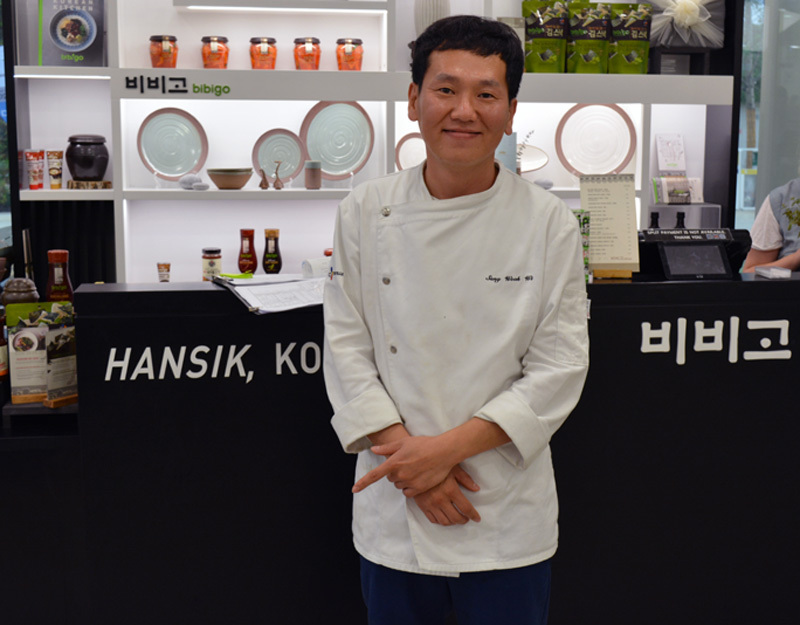 We are very pleased to be invited here and have a conversation with Sang Wook Wi, chef of Korea pavilion in Expo 2015. Q: How is it going in Milan Expo 2015? How long have you been here? Are you enjoying time in Italy? A: I am in Italy since middle of March and I am enjoying being here very much. Me and my team are in the project since January and we have worked on the menu before coming to Italy, brainstorming ideas, matching ingredients and preparations, trying to balance flavors between Italy and Korea in order to develop the menu. The restaurant Bibigo, owned by Korean Company CJ, organized the Korean taste project of the restaurant in the Korean Pavilion. I am in charge as head chef with a team of other five chefs, working together with 40 Italian staff members. Q:The theme of Milan Expo 2015 is ‘Feeding the Planet, Energy for Life’. 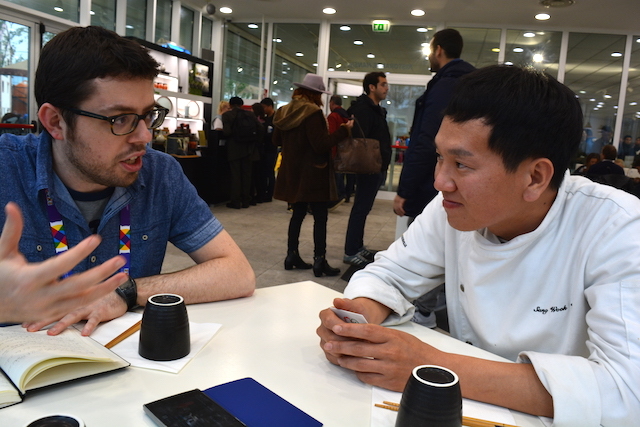 I’m wondering how you approached the theme in the project of Korean Pavilion, and how developed on the dishes. I was thinking about the theme of Expo and how affect your choices of cuisine. 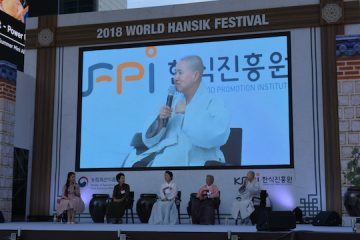 A: I think that focal characteristics of Korean Food are fermentation, harmony in the aspect of nutrition, for example protein, carbohydrate and vitamin, all nourishment is balancing in Korean food. Also Korean food is distinctive as healing, healthy food for a long life. Therefore we took into consideration these characteristics as fermentation, harmony and healing, when developing the menus. Here we are using chill pastes, bean pastes from Korea but the other ingredients are all vegetables and meat from local producers for freshness and economical reason. For matching process of ingredients it took time and we had to decide to change ingredients according to what was available locally. For example, in our menus in Korea, there is a “Jjangachi – 장아찌” (vegetables marinated in soy sauce for long time) as a side dishes using ginseng which is not allowed to pass custom entry in Europe. In this case we found an alternative ingredient, such as celeriac which isn’t found in Korea but tastes to similar to ginseng. Familiarity is one of our approaches to develop our dishes for European people. Thanks to our research, we found out that European like seaweed as a familiar Asian ingredient so we used it when creating some side dishes. Q: Another characteristic that I like about Korean Cuisine is that you are trying not to waste food. For instance when you cook vegetables and meat, you use like 90% of them. I mean, you use all parts of the ingredient, such as leaves, stems, roots and so on. Do you think that is something that western cuisine could learn from it? And I think this is also related to the Expo theme. In the restaurant do you also have this attention in avoiding waste of ingredients? A: I guess “Jjangachi – 장아찌” is a good example as an efficient cooking method for avoiding waste. It is a way of a side dish made with sliced vegetable or herbs ripened and preserved in soy sauce or soy bean paste. During Spring time in Korea, people collect wild edible herbs called Namool (나물) because in that period the herbs are soft and most delicious for salads and side dishes. When the herbs became stronger and older after Spring, Korean cook them for Jjangachi. In my opinion, the reason why Korean use most parts of ingredients is because we believe Nature is precious, it surrounds us, helps us and we should be thankful and respectful. Q: How do Italian people react Korean food here at the restaurant? I remember the first time I approached Korean food I was overwhelmed by the very strong flavors, spicy and salty. 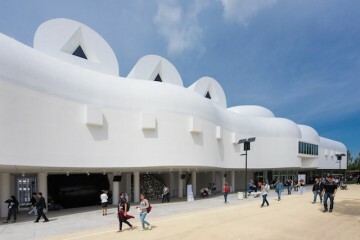 A: In the restaurant of Korean Pavilion, More than 1400 people have a meal here in a day. Many people want to eat here but our ingredients run out everyday so we sometimes we can’t satisfy their first choices from the menu and have to try something else. While creating our menu, we took into consideration the strong flavors of Korean food and our experience as international chefs, knowing that in some areas of Italy people eat very spicy food (south of Italy) gave us the limit between which we could experiment. When we develop the menus we had already discussed with local chef for the acceptance of compromising taste that doesn’t lose Korean flavor but makes local people enjoy the flavor of the food. We considered the delicacy of the spiciness for example. Q: We also had lunch here and we found and enjoyed delicious Korean flavor that seems like as we were back in Korea. One of our dishes was Kimchi jjigae that we found your delicate effort for the spiciness. A: Yes, I also think is one of the most of delicious dishes. Kimchi jjigae 김치찌개 is also a popular dish in the restaurant. We really thought our menus to be enjoyed by all visitors. Q: It was great. Now, I guess last few years, Korean food is becoming more and more known and there are many new restaurants opening in Italy as well in Europe. But it is still, I think, being discovered lately compared to other Asian cuisines. Do you think Korean food will catch up with other cuisine and which are the aspects of Korean cuisine that can help the Korea food becoming popular. A: In my case, I’ve worked on Korean cuisine professionally. Of course, I’ve experienced for Italian, Chinese and Japanese cuisine as a chef of a Hotel. I believe I know the different characteristics among other cuisine based on my experience. I think a key aspect of Korean food is the balance and presentation. For instance, there is a concept of Korean food, the Five Colors of direction (오방색 – obansek). Explaining about these Five colors concept will be useful to appeal Korean cuisine for its healthy and aestethic characteristics and as a high quality food. I think this is one of strong aspects for Korean cuisine. Q: So you mean some of the characteristics are the presentation of colors in a Korean dish and healthy effects from harmonizing the natural ingredients. A: I think people should be aware of these characteristics before approaching the Korean food for the first time. I would also recommend people to learn about the deep taste of Korean stews and soups. Q: As a chef, you are experiment and researching about Korean food. What I am wondering about is how how do you make a balance between experimentation and tradition in your cooking? Are there things that you keep from the tradition and some you leave behind? A: Food is always changing. For example, we added a milky mushroom porridge (boseotjuk 버섯죽) in the menu. Traditionally, Korean food also has a milk porridge called Harakjuk but for the people in Europe, a milk porridge doesn’t arouse their curiosity. Therefore I used mushroom for the porridge and make the texture more soft and foamy to resemble an Italian cappuccino. The idea to create this dish was to make people curious in Korean food and make them start a new journey into flavor. I think the border to keep food traditional should be flexible to the creativity. I don’t think this dish is a harm to the tradition but on the contrary is a diverse way to bring up the traditional way of cooking method and to develop it further. I would like to emphasize that every country pursues different own taste in their national food so we, as Korea, should challenge our cuisine to be competitive as they are, until we find a balance and people could appreciate and enjoy it. As an example, chef Nobu Matsuhisa in New York, served a raw fish with hot oils that slightly cooked the external part of the fish in order for people who don’t like raw fish to experience it. I think before people refuse Korean food as unfamiliar cuisine, we should try to show them Korean food as an attractive cuisine and a new, exciting experience. Q: The last question What is your favorite Korean dish? We would like to thank Chef Sang for his time and delicious lunch today!